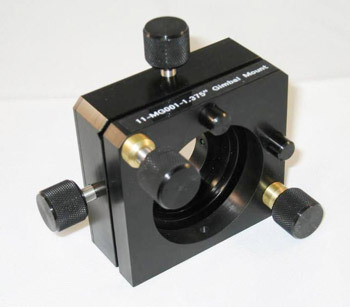 DPM Photonics is growing its product line in the area of opto-mechanical components. Please check back periodically to see product additions in this area. We would be happy to talk to you about any other specific needs you may have in this area, beyond what we offer as a standard product. Contact us at info@dpmphotonics.com or call us at (860) 872-6573 for more information. 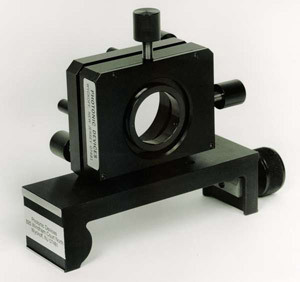 The Photonic Devices Model 11-MG001 was specifically designed for the precise alignment of laser beam expanders and focusing optics. Since most laser beams do not propagate along the mechanical axis of a laser rail, four (4) degrees of motion are required to optimize the performance of the mounted optical component. 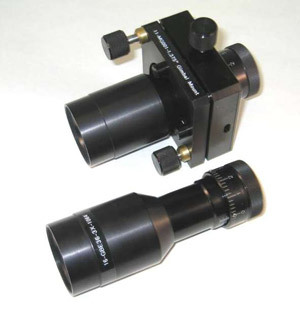 The 11-MG001 combines the features of a gimbal with an X-Y translator, thereby providing the adjustability necessitated by the alignment tolerances of most diffraction-limited optics. This gimbal can be mounted to either a Laser Carriage or Optical Rail slide mount via three #8/32 x 3/8" threaded holes. Standard bore diameters include 1.25", 1.48", and 1.50". (+/-) 4° (+/-) 3° (+/-) 0.12" (+/-) 0.15"